Taiwan just stepped it’s coffee game up. Coffe company Let’s Cafe has made it possible to print your portrait onto a latte, taking foam art to a whole new level. The Company operates it’s coffee kiosks out of Taiwan’s Family Mart convenient stores and are striving to give customers something they can’t get at the more established coffe joints. Order a latte, upload a selfie from your smartphone and the machine sprinkles the image into the foam using cocoa powder. Boom. You don’t even have to drink it. Just stare at yourself in all your frothy goodness. Of course the point is not just to stare and marvel. You’d be missing out on the moment if you didn’t whip out your phone and take a photo your foam portrait. Kudos should be given to Let’s Cafe. They’ve found a clever way to capitalize on both Taiwanese photo glut and a ridiculous “selfie” phenomenon gone global (thanks, Instagram). Now, instead of having cell phone photo shoots in your bathroom in fornt of a dirty mirror, you can have them at a local convenient store in front of random customers. As you pay for your latte you can seek the admiration of the store clerk for haven taken a picture that transferred to milk froth so well. How long will it take to get your latte? The reason Let’s Cafe has launched its new latte machine is so that it can better compete with larger coffee chains like Starbucks And Taiwan’s own Donutes Cafe. But they’ll do little to knock off the competition if it takes twice as long to get your order because of hyper stylized foam decorations–which begs another question to be asked: what exactly is an appropriate time value for detailed latte art? A nifty Starbucks barista can drizzle a maple leaf into your morning Cappucino and it only takes a few seconds. Let that same barista take an extra 5 minutes crafting your leaf and there would be a line of pissed off customers who couldn’t give two shits about the barista’s artistic pursuits. Of course Let’s Cafe’s foam art is derived from a digital image so you would think it shouldn’t take too long, but I would hate to be stuck waiting for my drink behind a group of Taiwanese middle school girls trying to decide on just the right photo to upload. Inevitably it would happen on your way to work or some other important engagement, but you would be in the wrong let your frustations get the best of you. If all you want is a quick latte you can go somewhere else. Those girls are there for the ultimate experience in Taiwanese coffee consumption; what Let’s Cafe is calling “ridiculously unique and fun.” Never mind that it took half an hour to get it. Will a photo latte be more expensive than a non-photo latte? After watching the promotional video it’s clear Let’s Cafe feels their latte photo machine is already a big hit in Taiwan, though I have yet to see one anywhere in Kaohsiung. They mention how their customized latte art became “the talk of the town” and “won over the hearts” of customers. What the video fails to reveal is how much it will cost, but I noticed something that makes me think it’ll cost a lot more that your average convenience store latte . It seems odd to charge more for something that will most likely disintegrate as soon as you put a lid on the cup which, unless you plan on enjoying your drink inside Family Mart, you will have to do, but not before taking a photo of it to share with others. This of course could create a vicious cycle: take a picture of yourself, have it put on your latte, take a picture of yourself with the latte containing your portrait, then have that put on another latte….I’m probably thinking about this too much. Are we allowed to put ANY photo on a latte? If so, we shouldn’t overlook the fun to be had from this in the form of well executed social experiments. 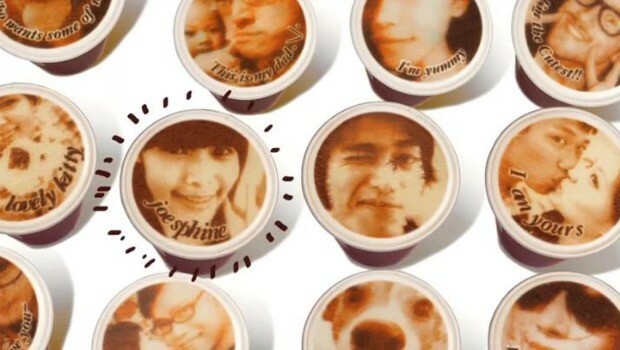 Better still, how fun would it be to have a dirty photo dusted atop your latte? Perhaps a set of tightened buttocks or a voluptuous pair of double D’s? Of course doing such a thing would mean putting the store attendant in a rather precarious situation: does he ring up your latte like normal and pretend not to see the pair of protruding orbs afloat in your cup? Does he refuse to sell it to you? On what grounds? Indecent espresso? Does Family Mart have a contingency plan in place if such a thing happens? They should. Again, maybe I’ve gone too far, but mobile photo glut has the tendency to bring out the worst in people. I have no information on when these machines will hit Family Mart stores in southern Taiwan (if they haven’t already), but if anyone in Taipei or elsewhere has tried it, I’d love to see the results. Drop a link in the comments or find me on Instagram @jaywoodson. As for me, I tend to get my coffee from 7-11, but I won’t pass up an opportunity to try it at least once. *Update: As fellow Taiwan blogger, Taiwanvore so nicely pointed out, Let’s Cafe will not be rolling out it’s photo latte machine in Taiwan after all. The video was shot by a marketing company hired by the makers of the machine itself. Looks like we won’t be able to plaster our faces (or body parts) on our lattes after all.